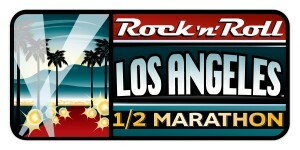 Since I've done LA Marathon so many times, I was hesitant to sign up for a half-marathon covering similar territory. However, I was pulled in by a discount and T-shirt the last time I went to a Rock n Roll expo in February. This race is meant to be a costumed race, which is something I've never done before (besides our LA Marathon bunny ears). Even when I ran the Disneyland Half a couple of years ago, I didn't really think of wearing a "real" one until it was too late in the starting corrals. This time, I had a feeling that costumes would be expected, so I put together something simple for "The Ukrainian" and myself. I guess I could have been more original with my costume, as I saw several other brides, some more simple than me, some with the full-on gown and up-do. I made my "tu-tu" out of strips of tulle from the fabric store and a long ribbon, making slip-knots along it. I also pinned a larger piece to my Jackrabbit cap (mentioned here). Now, I normally cringe when I see tu-tu's at most other road races (I mean, yes, we know you're a chick and that you're running, good for you... but talk about unnecessary extra weight to carry), but I figured it would be appropriate in this case. Would I do it again? Not anytime soon! We rode the Metro to the race, as we did the expo, to save on parking and gas. There were actually a lot of runners onboard Sunday morning. I found my younger sister volunteering as a "guard" of Corral 13. I am forever traumatized by corrals at Rock n Roll races because of a previous bad experience that I didn't even explicitly mention on here (but if you go to that post and look carefully at my bib, you'll get an idea). My other sister, who was running, was in Corral 4. Just tried my new 50% off ProCompression socks for the first time, and they are surprisingly very good! At one point, I kicked part of the uneven road (at the Coliseum... fu$c), and the top of my left foot felt a sharp pain. Luckily, it faded in about ten minutes, and also, I somehow was able to absorb myself in the amusement of other people's costumes enough to muster a finish, walking only at the water stations and at one point during Mile 12, inside a very hot tunnel. Took a photo of this at the expo... there was "mini-marathon," which had a medal nearly identical to the half. Yes, it's the end of October, and the race was as sunny and hot as ever (thank goodness I wore sunglasses!!). Before I knew it, I went from Mile 10 to 13, and given how uncomfortable it was to run in this garb, I thought my time was acceptable. Kudos to yet another well-organized Rock n Roll event... guess you gotta know how to do it "right" to have made such a big business out of it. Loved the little Jamba Juice cups at the end... and the Slurpees!! And with that (unless something changes), the 2012 racing season is over. It started out pretty well when I was coming off of residual fitness from training last year, but as the year wore on, my lack of training caught up with me. Not that I'm not happy with my performances, though. I do plan on taking a different approach next year, but in the meantime, I need to take a break (probably until December) and get married. Great costumes! How fun. Excellent job with your race, and I hope things cool down for you out there! the costumes are great!! I always get nervous about chaffing in one but looks like you did it right and enjoyed it!